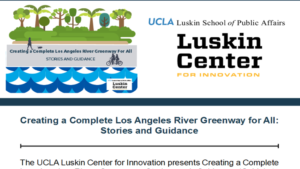 The UCLA Luskin Center for Innovation presents Creating a Complete Los Angeles River Greenway: Stories and Guidance (Guide) to recognize the achievements of those who have successfully developed portions of the Los Angeles River (LA River) greenway while providing advice to those interested in promoting a continuous greenway in their community. This Guide features 14 case studies of small and large projects that have improved community access to the LA River and/or created parks, pathways, or bridges along it. We include considerations for how to: develop clear project goals, strategic partnerships, and reasonable timelines; engage and empower community members; develop creative project designs; determine accurate project costs; consider funding options; effectively coordinate with numerous permitting agencies and private land owners; and sustain long-term project operations and maintenance.